You can obtain skills from certain items crafting NPCs. - [Medicine Crafting], [Armor Crafting], [Food Crafting]. [ Helmet Crafting] from Cai Lun near Hong Kong. Learn [Armor Crafting] from KumHual Li, and [Weapon Crafting] from Gan Jang. After this, you may either learn from a selection of wandering NPCs who travel the world or from other players. You can obtain crafting skills from other players who are on [ Community][Artisan] in game. They must be of at least Artisan title themselves in each craft to teach craft skills. 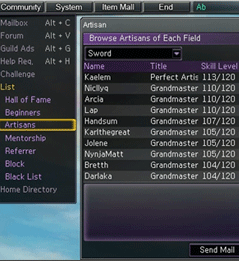 Artisan's learn from players with the title 'Craftsman' and so forth with later titles. Learning from NPCs has no limit. 1. Click to see the crafting skills list in Game Menu - My Info - Skills. 2. Select the field of an item you want to craft. Items that you are able to produce will be displayed depending on your crafting skill. 3. Choose the item to see the materials required to craft. 1. When you have all the materials, click [Craft]. If started successfully you will then see a preview of the item been crafted and a percentage bar in the top left. 2. The percentage completed of your craft will go up while Auto-Crafting or according to the workload gained during battle. The tougher the opponents, the more workload per battle you earn. Once you reach 100% the craft will be completed and you can collect what you have just crafted. 1. You get experience points when you craft an item at a rate of 1 experience per 50 workload completed. 2. If your crafting experience points satisfy the required experience points to increase level, you can increase your	level. 3. 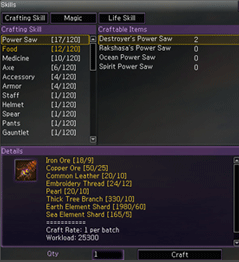 Levelling up your Crafting Skill can be done by learning skills from item crafting NPCs or other players. Enchanting items improves the basic capacity of your equipment. Attack power will be upgraded for weapons and defense power will be upgraded for shields. 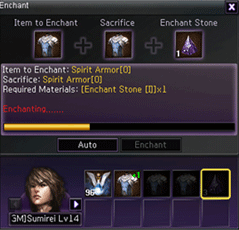 You need two of the same items and enchant stones in order to improve the status of the item. 1. You can go to [My Information] [Enchant] in the Game Menu or just right click on the enchant stones. 2. You can register the item you want by dragging two of the same items or you can use the [Auto] button which selects two of the same item and appropriate enchant stone automatically. 3. Once you complete the registration, click on [Enchant] to begin the process. Enchanting two +0 items usually results in a +1 of the same item, however on rare occasions the result may come out up to +4. You can obtain crafting skills from other players who are on [Community] [Artisan] in game. They must be of at least Artisan title themselves in each craft to teach craft skills. Artisan's learn from players with the title 'Craftsman' and so forth with later titles. Learning from NPC's has no limit. *You get experience points when you pass down your item crafting skills. For each enchantment the stats, attack or defensive power given by the enchanted equipment will incrase, improving your ability to fight or survive. Certain stats do not increase with enchantment however; including Magic Defense and Evasion. *When your item reaches a certain level the item will gain some additional stats or a certain affect depending on the enchantment level. *Durability: When you enchant an item to +5 then a durability factor will be created. Once this is applied then you must use different levels of Hammers to repair equipment when it becomes damaged. The level of hammer is the same as the enchant stone it would require. Equipment of Level 70 or above will have durability factor from +0. At +6 through +9 the max durability of an item will increase. At +10 the durability is removed and the item will never break. *Seal item: When your item reaches level 7 enchant, the item will be sealed. The item will belong to the player who unsealed it. You can seal the item again by enchanting it to the next level. Low level items of a level 60 requirement or below gain durability gauge set at a +5 enchantment or above. Level 70 requirement items or above have this gauge right from the start. when items durability reaches 0 none of its stats are applied until it is repaired. 1. To dismantle an item right-click a Hammer item in your inventory. This will open the [Refine] window, with the [Dismantle] option selected by default. 2. Select an item you wish to Dismantle then the appropriate level of hammer between [I] and [V] according to the level of the item you are dismantling. Pressing [Auto] selects items from your inventory and the required hammer automatically. 3. After choosing [Dismantle], your item will be disassembled and you will receive a number of [Elements], type varying according to the item you dismantled and its enchant level. Generally weapons yield more elements then armor. Accessories dismantle into Gemstones such as Topaz or Opal. 1. Repairing items requires another type of item instead of a Hammer. It instead uses items called [Repair Stones] available from the market at a fixed price. One repair stone restores 10 Durability to have the item being repaired. But beware! 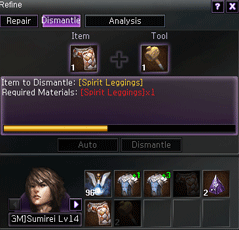 If you cannot craft the item yourself - or an equivalent level - then you will lose 5 Max Durability when repairing. Although this can be recovered by enchanting the item. Note that like Hammers, Repair Stones also come in [I] through [V] variances. 2. Right-clicking the Repair Stone in your inventory opens the [Refine] window, with the [Repair] option selected by default. Here you can select items manually, along with the repair stones - or press [Auto] to select those items automatically. 3. After choosing [Repair] your item will be repaired automatically according to the amount of repair stones used whether one or ten. You generally move items simply by clicking on them, then clicking somewhere else in your inventory. However there are also other things you can do with items in your inventory such as wear them, split into different slots, destroy the item or even register a Quick Slot so the item can be used in battle. 1. You can wear an item by dragging the item your character's equipment window. 2. If the item is in your inventory, you can wear it by right clicking. 1. Items can be separated into two stacks by clicking to select the item, then holding down the [Shift] key when clicking to select a new location. This opens the [Item Transfer] window where you can enter an amount to move to a new stack. You can destroy an item by selecting an item then clicking outside your inventory window. 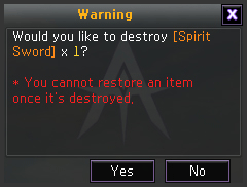 A warning box will appear and if you click [OK], the item will be destroyed. *You can never restore your item after you destroy it. 1. You can use shortcut keys for items whenever you want to by various items in Quick Slots located just right of the character icons in your inventory. 2. Characters can only have two slots. But you can have one more if you join a Guild and if the Guild is governing a town you gain access to two more for a total of five. *If you want to use items by using shortcut keys during a battle, you can register the items in the Quick Slot before you are engaged in a battle. 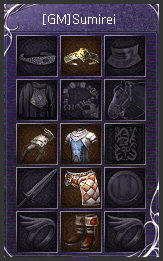 **Most items can be registered in Quick-Slots; most notably [Potions] and [Scrolls]. Certain items such as [Food] or [License] can also be placed into the Quick-Slot inventory, but they cannot be used in battle.